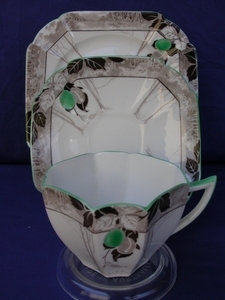 A beautiful vintage cup, saucer and side plate (tea sized in the Queen Ann shape) by Shelley in the Green Damsons pattern (11833) which was entered into the pattern book during or after 1931.� The backstamp on this particular piece was used between 1925 and 1940. They are in excellent condition, having no repairs,�chips, cracks or stains, and has no crazing which is unusual for�a piece of this age. The green trim is in excellent condition.